With God’s help and St. Nicholas’ prayers, I have survived aboard a rowing boat in the Southern Ocean for 120 days. It’s very cold today. The wind turned southerly, that is blowing from Antarctica. The boat is going to the northeast and I am currently not able to maintain the correct course. It is snowing. It is a full-fledged snowfall with the average wind speed of 30 knots, and the boat is all white with snow. The good news is that I’ve crossed the 1000 miles to Cape Horn line. I see three-digit numbers on the distance graph of the onboard computer “distance to waypoint” to Cape Horn currently 998 miles, I hope I will live to see the two-digit numbers. I allowed 50 miles per day in the Southern Ocean, on average. With the distance from New Zealand to Cape Horn of 6,000 miles, it should have been around 120 days. To date, I’ve logged 5,200 miles (9,350 km), which means the average daily distance travelled during this expedition to date is 43 miles. I can also see that the fastest daily passages were in the first months of the journey when the summer weather was favourable, I worked a lot on deck rowing and the boat had not yet got foul with barnacles. Exactly four months ago I set off from the shores of New Zealand, and it is still a thousand more miles to Cape Horn. It does not seem much compared to the distance already travelled, but on the other hand, it is the distance from Moscow to Chelyabinsk (city east of Ural mountain range)! The Southern Ocean did not live up to my expectations, I counted on long periods of westerly winds and a circumpolar current, with long, passing waves. That is how I remembered and knew this Ocean. I’ve been sailing here since 1990. And, most importantly, I saw and experienced all this when I was sailing on yachts. Sometimes the westerly winds persisted for two weeks straight, and I did not have to tack about for half a month. This year’s weather patterns have been very different. I must make every effort to break through further south to about 57 degrees south for the safe passage of the island of Horn. I am planning to travel 200 miles to the east and 1 degree to the south (60 miles) for the next few weeks. This way I should be able to enter the Drake Strait. If I would not be able to reach this latitude, there is a risk of being thrown to the west coast of Chile. 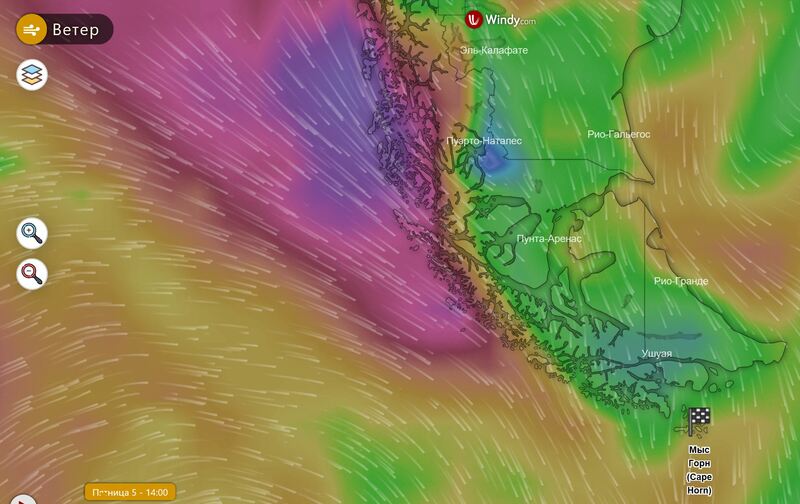 It looks terrible even on a map – the entire coast is cut up by storms and winds.